Rock-Paper-Scissors is a simple hand game played between two people, where each player outstretches his/her hand to simultaneously form one of three shapes – a “rock” (fist), “paper” (a flat hand), or “scissors” (a fist with one’s index and middle fingers forming a "V"). Although the game became popular in Europe during the early 20th century, it traces back through several centuries of Japanese history, and before that, to its origins in China where it may have been invented as early as 200 B.C.E. The game can result in either a tie, or have one of three outcomes: rock crushes scissors, paper covers rock, or scissors cut paper. For the purpose of my analogy, we’ll assign values to “rock” – the government; “paper” – fiat currencies, and “scissors” – silver. In application then, a strong historical case (backed by 5,000 years of history) can be made that “silver scissors” will inevitably win out over the oppressive stone of government edict, as well as the un-backed paper currency they issue and which the banks expect people to accept. Even if silver scissors are periodically “crushed” by government-induced price takedowns, both stone and paper can be – and so far ultimately have been – destroyed. As the process plays out, the value and utility of one’s “silver scissors” can be minimized on a cyclical basis, but never completely loses its residual value. "Inflation is as violent as a mugger, as frightening as an armed robber, and as deadly as a hit man." Ronald Reagan made the above statement. Inflation, pure and simple is a TAX on those who save and produce. It helps the government pay off its debts with cheaper money. In one sense, it appears to destroy wealth. But in a profound and indeed more accurate sense, inflation also redistributes it! The officially published inflation rate is often understated, given that many items commonly used by the public are intentionally left out of the government’s measurements, e.g. especially the Consumer Price Index (CPI). Because of this, recipients of government give-backs like federal pensions and Social Security will find that their checks understate the damage done by inflation – causing their purchasing power to decrease even as the nominal rate of what David Morgan of The Morgan Report calls the "paper promises" they receive appears to be growing. Inflation and its true effects are poorly understood by the vast majority of the public. (To give you an idea of how damaging this can be – it has been estimated that since 2000, the true purchasing power of Social Security recipients has declined since 2000 by... 22%!) How to “manage” inflation is just as poorly understood by economists, governments, and central banks. At a psychological level, people take a long time to really “get it.” It seems that inflation has to rise to a certain level before pandemonium breaks out and everyone begins to desert the local currency for something more tangible. (See Venezuela, Argentina and Brazil today.) In the process, consumers will move through a series of asset categories on the way to losing faith in a given paper currency altogether. In order to visually demonstrate this process, the late John Exter, an economist and U.S. Federal Reserve Board of Governors member, created in the late 1970’s what has come to be known as Exter’s Pyramid (also called Exter’s Golden Pyramid). 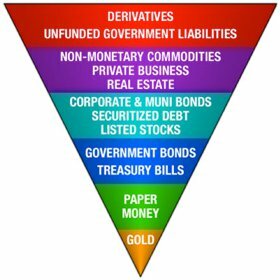 The idea is that categories high on the chart are just derivatives of other asset classes further down the pyramid. Although the balancing base is small, its asset gold (and silver) – is actually the least risky and most supportive category, because no one has any claim to it, other than the person who actually holds it in his/her hand. No derivative, regardless of category can say this. Indeed, gold’s placement indicates that Exter believed it was the most safe and reliable form of wealth. Thus the higher up one goes, the more risky each successive asset category becomes. 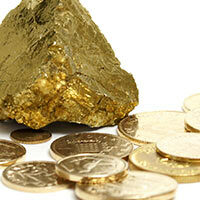 The financial components above gold all have more and varied claims against them. In a sense, each category is a “derivative” of honest money – gold and silver. When assets represented by the higher layers falter, money flows to the lower levels of the pyramid. And when paper money fails, the only thing left is gold. In a nutshell, the notional value of the paper market can be much larger than the underlying physical assets. Imagine a desert island with one coconut tree that produces one coconut per year. Now imagine that somehow that one coconut is supporting a hundred firms trading coconut stocks, coconut bonds, coconut futures, and coconut derivatives. All of that activity is resting on an inverted pyramid supported by a single coconut per year. Like gold, the coconut is real. The farther away from the coconut you go in the pyramid, the more derived and abstract the value of the asset and also the larger the market, because the paper market is puffed up with hot air, empty promises, Armani suits, and horse***t.
There's an idiom relating to someone who performs poorly at a task – such as waiting to buy gold and silver until it's marked up sharply in price... assuming that it will be available at all. They say he "laid an egg." Wait too long, and the egg you may lay is likely to be made of something else entirely!